I absolutely adore this carrot and quinoa salad of mine - it’s bursting with flavour, filling, healthy and low in calories. It’s a perfect salad to take with you to work. It is full of protein-rich ingredients – soybeans, quinoa and chickpeas – which all make you feel full without having to eat too much. What you need to be aware of though, is that the iron in vegetables and grains – called non-heme iron - is less easily absorbed by the body than iron from meat, poultry, fish and shellfish. A good way to increase the amount of iron you absorb from vegetables and grains – if you are not eating it together with animal-based protein - is to eat it together with food rich in vitamin C.
The watercress that I add to this salad is rich in vitamin C. Other vegetables rich in vitamin C are broccoli, green peas and sweet red peppers (bell peppers) and these vegetables could all be added to the salad. You could stir-fry broccoli together with the carrot batons, or add cooked peas and/or raw red peppers (bell peppers) to this carrot and quinoa salad. 1. Start by getting the vegetable stock to a boil in a pot. Add the quinoa, return the stock to a boil, stir well and then lower the heat to a simmer. Cook for 15 minutes, drain in a colander before tipping the quinoa back into the pot. Allow to stand for a few minutes before fluffing with a fork. 2. Add frozen soya beans (soybeans) to a pot with boiling water. As soon as the water comes back to a simmer, cover with a lid and cook the beans for 4-5 minutes. 3. Add 1 tablespoon of oil to a wok or large frying pan over a medium high heat. Place the mustard seeds in the wok or pan and as soon as the mustard seeds start to “crackle and pop”, add the cumin, turmeric and cinnamon and fry for about 30 seconds before adding the chopped carrot. Season with salt and black pepper. Stir-fry for about 2 -3 minutes – the carrots should still be crunchy. Add the chickpeas and give everything a good stir. 4. Take the wok or pan off the heat. Stir in the quinoa, soya beans, spring onions (scallions) and chopped chives. 5. Whisk together all the ingredients for the dressing. 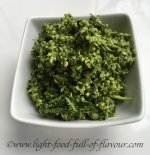 Place the watercress at the bottom of a salad bowl or spread it out on a large plate. 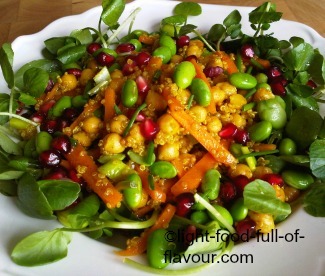 Place the carrot and quinoa mix on top of the watercress, drizzle the dressing over the carrot and quinoa salad and scatter pomegranate seeds on top.